Compression and cold therapy combine to deliver the ultimate non-toxic pain relief, the Pro Ice shoulder wrap. Pro Ice products maintain a consistent temperature for an hour, delivering the optimal ice therapy. Pro Ice cold wrap includes compression straps which not only help the body heal, but also keep the wrap in place, allowing for mobility while icing. Icing can help with acute injuries, such as shoulder strain, or help prevent long-term damage from repetitive stress injuries. Find relief from bursitis or rotator cuff injuries. Simply ice after an activity to help the body repair damaged tissues and prevent chronic pain. Pro Ice combines the ultimate in convenience and comfort. Pair the wrap with a cooler bag for the ultimate in portability. 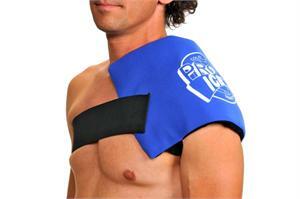 Enhance the compression that comes with the Pro Ice Shoulder cold therapy system with an additional strap. Compression added with icing creates a perfect mode for cold therapy.